I had a business trip to London with a week-end layover. 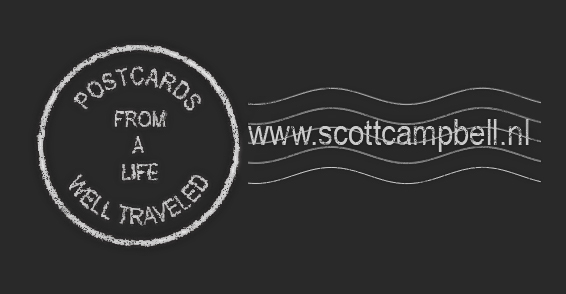 With that kind of time in a location like that, you would think that I would have a ton of postcards to present. Not so. This time around I didn't take as many photographs as I usually do, although perhaps I can claim a case of quality over quantity? The opening photograph is a variation on the London Underground theme of a red circle and blue rectangle. I created it using a roll of red tape, a blue pen, and a piece of white paper. The Lancaster Gate tube station was close to my hotel and was my main entry point to the Tube. The platform is accessible only by elevator or by a 128 step stairway. Not surprisingly, I noticed that not many people take these steps. Since there would be little interruption, I decided to explore the stairway with my camera. The first thing I noticed was the curve of the stairway: it reminded me a bit of a fan. About half-way down, I came across this ‘peek-a-boo’ mirror and wondered why it was placed in this particular location. The intent seems obvious. I could see this couple around the curve coming up the stairs, but it is a circular stairway. If the idea is to allow people to see around the corner, shouldn't there be one continuous mirror all the way down? I had time on this trip to look up a couple of old friends. I met up with Barb and we went out for supper at a Polish restaurant. Any cold-climate country's cuisine is high in comfort food. The Polish seem to have a thing for pancakes, so I had potato pancakes for the main course and super sweet apple pancakes for dessert. Awesome. Barb let me take this photo of her as we strolled along the Embankment afterwards. There were some funky blue and white Christmas lights hanging on some trees and I thought they would make a nice backdrop. I also met up with Karen and David. They took me on a walking tour of their neighborhood in the East End. In all of my visits to London, I hadn’t spent any time in the East End, so it was a wonderful chance to explore. We came across this wall of graffiti on an old rail station house. On my way to meet up with Karen, I explored St. John’s Church, which is near the exit from the Bethnal Green Tube stop. Designed by Sir John Soane and consecrated in October 1828, it has nice clean lines and there is a nice shot of the balcony in the slide show, but this open doorway inside the church really caught my eye. Karen took me to Pellicci’s for lunch. The staff were wonderful and the food was great. I highly recommend this place to anyone going to London who wants an inexpensive, traditional style café that serves really good food. While I just missed the Curry Festival at Brick Lane, the market runs all the time. I think you can find anything at this market. There was everything from regular market stall-type vendors to people sitting on the sidewalk selling out of their backpacks. The protocol seemed to be to put your wares out on the sidewalk, sit behind them, smile, and engage people as they go by. So what were these guys selling? Karen worked in the music industry for many years and as we walked around she pointed out places where various rock bands had their photos taken for their album covers. I decided to make a ‘cover’ for Karen and David, should they make their own music someday. I didn’t take many shots while I was in London, but a slide show of the ones I did take is here.